Glen Falls is three tiers of 70, 60, and 15 feet in height (pictured here is the upper tier) for a total of about 145 feet of falling water. Each tier has its own character, but the top two are the only ones you should bother to see - but I recommend those highly. The top tier is a multi-streamed free-fall with some cascades at the bottom. The middle tier is a wide cascade with lots of individual streams and free-falls over neat, banded rock. Both are beautiful and photogenic, as is the view of Blue Valley from the overlook near the top of the falls. From downtown Highlands, go West on US Hwy. 64 and take a left on NC Hwy. 106. Turn left on SR 1168 after 1.7 miles (there is a sign for Glen Falls). Immediately bear right onto the gravel road which follows the creek downstream to a dead end at the trailhead parking. 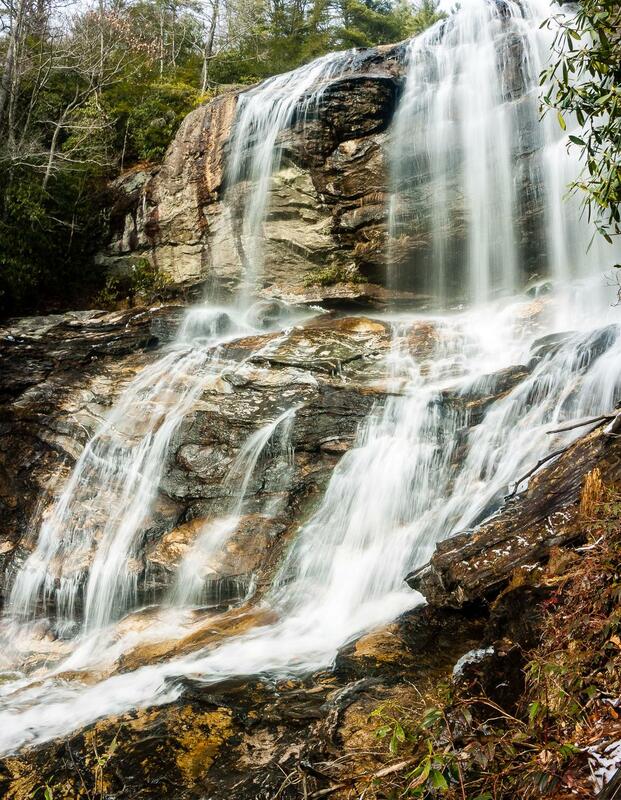 Follow the signed Glen Falls trail for just over 1/4 mile to the upper section of the falls. The trail is downhill and moderately rough, so remember that for the climb back out. A short loop leads to an overlook over the top of the falls; stay behind the railing. Continue downhill on switchbacks another 0.15 mi to the base of the upper tier; continue another 0.1 mi to the base of the second tier. Side paths lead to observation areas at the middle and lower tiers of the falls.